They have to go. 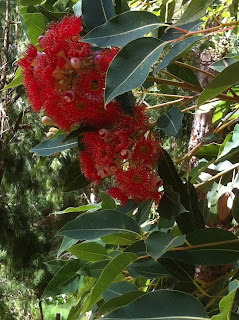 The gum trees that is! 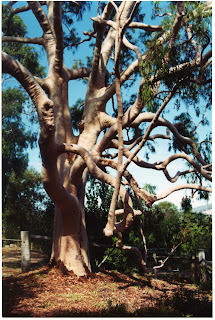 Some years back I had a lovely old property in Bridgetown that had a jarrah-weatherboard house, beautiful old camellias and a magnificent Lemon-scented Gum, Coyrymbia citriodora. 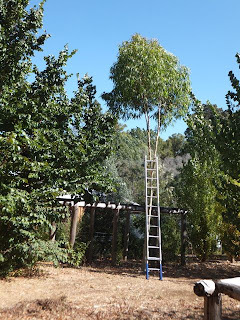 The tree had many seedlings and was a favourite feeding tree for the red-tailed Black Cockatoo. I planted three seedlings of this tree at my present property in Balingup and they have grown very well in three to four years. Now I realise they will only grow much bigger and have the potential with their bark and leaf fall in summer to add to the fuel hazard around the garden. I don't have the time to spend raking and mowing the leaves to stop them building up, so we had to make a decision as to whether to have a continuing maintenance problem or take them out whilst we still can. To have a professional tree feller come and remove the trees when they have grown more can cost thousands of dollars, so the decision is to take them out. With new rules being applied in some Shires about a 20 m Circle of Safety or the Building Protection Zone that should apply around houses and sheds, it makes sense to act earlier rather than later and reduce the fire hazard on our properties by removing these trees. be cut down with a chain saw. The essential feature of these zones is to remove inflammable material from these areas from the ground and to keep trees that are near the house or sheds at least 10 m apart. The 10 m being from the outside of the canopy to the next. Trees with volatile oils in their leaves need to be carefully placed, trimmed back or removed altogether for improved safety. Trees if kept are to be pruned up at least to 2 m.
branches removed ready for the chain saw. There is still debate about the role of deciduous trees which may provide a screening effect and if kept moist and without dead material held in their branches can take the heat out of a fire. Perhaps the season is really changing and the cooler weather is beginning. Already the days are noticeably shorter. Well, so they should be as the equinox is just about upon us. Any rain will be gratefully received, not only to freshen up the gardens and the forests, but also to reduce the risk of wildfire. Last week, near Balingup, we experienced a bushfire emanating from a nearby plantation, that took three days to control. Friends, not far from the fire, decided to move out whilst the heat was on. is needed to reduce the fuel load. The good aspect about the friendlier weather is that it is considerably more comfortable to be out in the garden. There's plenty to do from a risk management point of view when it comes to reducing fire risks. Even this morning I found a patch of dry grass in one section of the garden which I had overlooked all summer - just the place for an ember to fall and catch the grass and some well-placed dry eucalyptus leaves. Time to make use of the gardener's friends: rakes and secateurs to tidy up and reduce the build up of fuel. The garden will look more presentable, too! In the South West of Australia we have a mediterranean climate, i.e. hot, dry summers that seem to last for at least five months and cool, wet winters. The winters have, in the past few years, been notable for their lower than average rainfall. or other places with a similar climate. up to become ground fuels for a bushfire. We share this climate with just a few places in the world, namely southern California, the Cape Province of South Africa, parts of Chile and the countries surrounding the Mediterranean Sea. The plants that are native to these regions will in many instances grow happily in any other mediterranean-climate country. 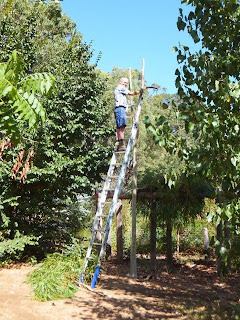 The trees and shrubs of these countries have adapted to surviving the long summers by a variety of methods, including making use of fire to regenerate trees and shrubs and to spread seed. 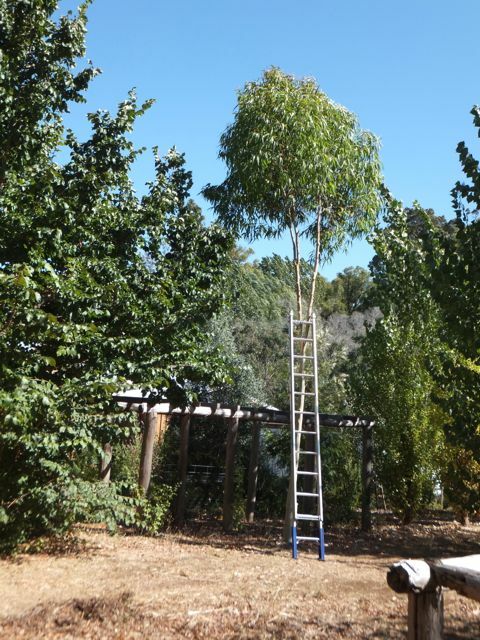 In our garden design and in choosing plants we need to be mindful of whether we are at risk of destructive wildfire, both with respect to what sort of plants are in our gardens, where they are located and our proximity to forests and scrublands. There are many factors which will influence whether we are well prepared to survive a bushfire. In this blog we will discuss and try to inform the debate about how to make our properties and the surrounding landscape more firewise and less dangerous.